If you enjoy working with hair, a full-time career as a Hairdresser may be just the fit for you. Hairdressers are therapists and artists in their own right. They provide hair care and beauty services to make their clients look and feel good. They can be found working in hair salons, barbershops, or beauty parlors, offering their clients an array of hair styling options. Do you have people skills? Can you endure being on your feet for most of the day? And finally, do you have the keen attention to detail needed to perform perfect work and satisfy your clients? 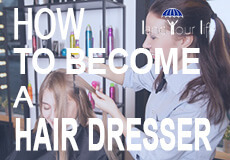 Whip out your brush and hairspray, and follow this Land Your Life exclusive guide to becoming a hairdresser. According to the U.S. Bureau of Labor Statistics, hairdressers require a high school diploma, or its equivalent, for employment opportunities. Additionally, every state requires hairdressers to be state-licensed to practice hairdressing. In order to become licensed, aspiring hairdressers must successfully complete a cosmetology program, get hands on training, and pass a state board exam. Some states allow apprenticeships in lieu of completing school, but still require students to pass the board exam. Cosmetology programs can be found at select high schools and vocational schools. They typically last 9 months and some award students an associate’s degree upon completing the program. Students can expect to learn a variety of hairstyling topics including texturizing, color methods, and salon management. The American Association of Cosmetology School (AACS) offers a vast list of cosmetology programs to choose from. States approve different programs and have different licensing requirements. Before embarking on a cosmetology program, hairdressers should check with their state’s specific requirements. Generally, in order to qualify for a license, aspiring hairdressers need to be a minimum of 16 years of age, have a high school diploma, or its equivalent, and have successfully graduated from a state-licensed cosmetology school. After graduating, students need to take a state-licensing exam that can include both a written and practical test. Once students have graduated from their programs and passed their state-specific board exams, they must renew their license regularly. These renewal practices differ from state to state so it’s important that aspiring hairdressers understand their state’s regulations. Hairdressers offer a range of services from cutting hair to providing scalp treatment. Their main priority is to satisfy a client’s needs while enhancing that same clients’ appearance. Typically, hairdressers can expect to shampoo, cut, color, and style hair throughout their workdays. Hairdressers are skilled in working with different hair types, lengths, and textures, so they can take on any client’s hair. They’re also skilled in using a variety of beauty products and tools such as color treatments, clippers, and curling irons, to name a few. Since the health of a client’s scalp and hair is important, hairdressers also provide treatments and tips to prevent unnecessary damage, breakage, and split ends. Building rapport with clients is extremely important, especially since hairdressers rely on the patronage of returning customers. Hairdressers record the services clients ask for, the preferred products that were used, and any specific hair colors and treatments that were applied. That way, when customers return, hairdressers can easily initiate dialogue about the clients’ past visits and preferred products to show that they’re invested in their client’s hair care. What Does an Average Day For a Hairdresser Look Like? Hairdressers start their day doing preparation work. This often involves reviewing the list of clients for the day and prepping workstations by sanitizing equipment and laying out the needed supplies. In between clients, hairdressers can expect to repeat this preparation work by wiping down their client’s chair, sweeping the floors, properly laundering towels, and setting up any new supplies. Before they work on their client’s hair, hairdressers provide quick consultations to discuss what their client’s want, before providing tips on what styles will look good. These consultations involve the hairdresser inspecting their client’s hair and scalp and discussing hair-style options. The hairdresser brings up, in as much detail as possible, what their clients want to get out of the appointment, to ensure the client and stylist are on the same page. Hairdressers spend the majority of their workdays styling and treating their client’s hair. They also recommend hair care tips, products, and ways to maintain their client’s hairstyles between appointments. They can expect some days, where they’ll only provide shampoo and haircut services and other days of clients asking for complicated coloring and styling services. Some stylists specialize in one area in the salon, like color treatments or applying extensions. These stylists can expect to perform the same duties throughout the day. A happy customer is a returning customer. Hairdressers know the importance of customer relations and making the client feel at home at the salon. This can involve anything from smiling at customers to offering them refreshments. As far as conversations go, hairdressers need to keep it positive and let the client know that they care. When providing advice on how to care for hair, hairdressers should be patient with their clients and be prepared to answer questions. Any frustrations should never be taken out on the customer, even if the customer has neglected to take care of their hair. Most hairstylists perform administrative duties throughout the day. This can involve fetching refreshments for their clients or using the cash register to ring up clients. They also keep track of receipts for salon managers who typically want to keep records of the hairdresser’s shifts. Are You Suited for A Hairdresser Career? They’re trendy and creative, which allows them to keep up with the latest trends and successfully execute new hairstyles. They employ their great customer-service and listening skills to build rapport with clients. By listening and fulfilling their clients’ needs, hairdressers become trusted practitioners and are able to achieve high customer retention rates. When it comes to their workstations, hairdressers must always be tidy. They’ll need to continuously clean their supplies and uphold sanitary regulations. Customers in a tidy place will feel comfortable and are more willing to return to salons. Additionally, hairdressers must ensure their own personal appearance is good and professional, especially their hair. It’s only natural for customers to judge their hairdressers’ skill levels on how well they treat their own hair. Hairdressers also need to have a keen attention to detail. When cutting or coloring hair, for instance, the slightest mistake can ruin the intended style and frustrate a customer. Hairdressers must also have great physical stamina and time-management skills to excel in their careers. Without stamina, they’ll find it difficult to endure being on their feet for most of the day. Without time-management skills, they’ll be unable to provide timely services for their clients and could potentially lose them. Hairdressers must understand how to juggle different services requiring different amounts of time. Hairdressers need to be licensed within their state, before they can practice hairdressing. In addition to this license, hair stylists can choose to be certified in a specific area of hair styling. For instance, they can choose to be certified in coloring hair by the American Board of Certified Haircolorists or sanitizing equipment through Barbicide® certification. Hairdressers need to be proficient in using hairstyling equipment. They’ll need to master tools like flat irons, curling irons, and hair clippers to name a few. They’ll also need to understand the different products their salons offer. How Does A Hairdresser Find Work? Hairdressers can find work in a variety of ways. Their cosmetology school, for instance, provides job placement services, which hairdressers need to take advantage of. If they have a favorite salon, hairdressers should drop by, offer the manager their resume (even if the salon isn’t hiring), and ask the manager keep them in mind. Additionally, generic job search tools provide plenty of applicable job posts for hairdressers to sift through and apply for. But the best way to finding a job as a hairdresser is to join professional organizations. By joining professional organizations, hairdressers can network, make connections in the business, and find out about new jobs through word of mouth. Professional organizations also provide members with exclusive job databases. What is the Average Salary of a Hairdresser? In 2017, the U.S. Bureau of Labor Statistics (BLS) reported that barbers, hairstylists, and cosmetologists earn a median yearly salary of $24,900 per year. As far as location goes, the District of Columbia, Washington, New Jersey, Massachusetts, and Virginia are the top paying states for this occupation as of 2017. There are ways to increase one’s chances of reaching the higher end of the salary range, besides moving to one of the top five paying states. One such tip is to find work in industries renowned for paying hairdressers more than other industries. BLS reports five top paying industries for hairdressers: performing arts companies; professional, scientific, and technical services; outpatient care centers; accounting, tax preparation, bookkeeping, and payroll services; and offices of other health practitioners. Other ways to increase one’s salary is to work for salons that sell their own beauty products. That way, hairdressers can earn a commission rate for every beauty product they sell. The U.S. Bureau of Labor Statistics (BLS) reports that the employment of hairdressers is expected to grow 13% from 2016 to 2026, which is faster than average compared to other occupations. BLS also reports that the demand for hair coloring, straightening, and other advanced services has grown over the years and is expected to grow in the coming years. Work at salons, barbershops, and other hairstyling stores, to provide hare care services for their clients. These services can include anything from routine cuts to intricate colorings. Hairdressers work one-on-one with customers to style their hair and improve their overall appearance. Experienced hairdressers with great people skills, communication skills, and hair care proficiencies are suited for the job. Work with retail health and personal care stores to sell beauty products and other merchandise. In these stores, hairdressers become ambassadors for their employer’s products, teaching clients the benefits of the products, and how to use them. Teach and supervise students in technical, trade schools. Hairdressers who’ve mastered their art help to pass along key skills and proficiencies to other aspiring hairdressers. Experienced hairdressers with great communication skills, patience, and a passion for teaching are suited for the position. Work in motion picture and video industries to style the hair of actors, stunt doubles, and other individuals who’ll appear on screen. Experienced hairdressers who can work well under strict time constraints and among a team of other star beauticians, are suited for the position. They must also have a keen understanding of trends and current styles. Annual mean wages differ greatly by state, movie budgets, and the specific job’s requirements, reaching $64,580 for select performing arts companies. Perform other personal services in the field of hairdressing. This can include working at boutique salons that offer expertise in one area such as child hairdressing or offering personal services for large events, like weddings. Either way, experienced hairdressers specializing in one area of expertise are perfect for the job.